It all starts on a Monday afternoon, as you arrive home from school and your dad arrives home from work. He comes to say hello and asks, “Do you have any test this Friday?” to which you reply “No.” He cracks a smile and says “I think we should play a little hooky on Friday and head up north Thursday night to go fishing this weekend.” You never could have imagined how wonderful those words sounded. From that point on Thursday afternoon cannot come fast enough. As the week continues, you pack and unpack your flies, tippet, swivels, weights, pliers, nippers, many more things, to make sure you have everything you could possibly need. You pull out all of the DVDs (Or VHS tapes when I was young), fishing magazines, and search for all of the updated fishing reports. 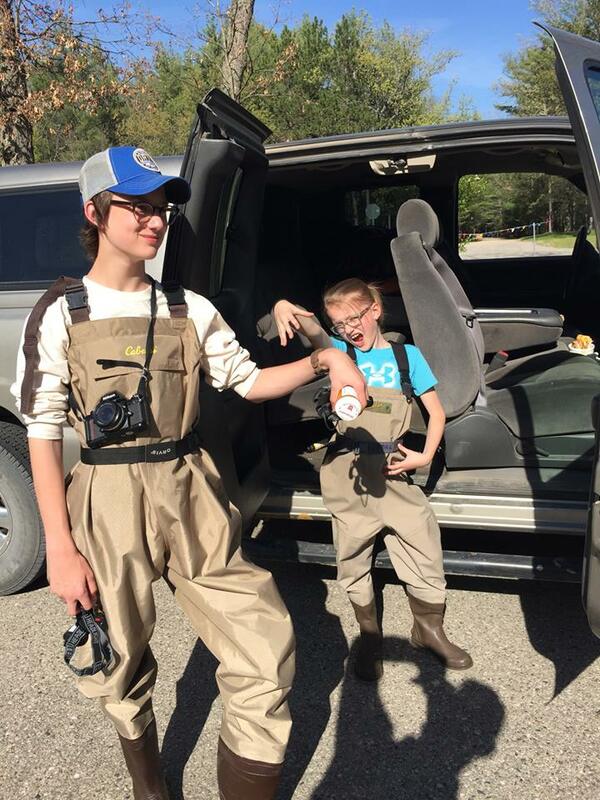 Your buddies get tired of your bragging all week telling them how cool your dad is taking you out of school to go fishing. All of a sudden it is Thursday and you are on the bus on your way home. The excitement level is through the roof and you can’t contain yourself as you run through the door, throw your backpack indiscriminately on the floor and start putting all of your gear at the front door as you impatiently wait for dad to get home. Mom is telling you “Settle down” and “do not put that there I am vacuuming, he will be home soon.” He gets home early, and you start running out to the car to start packing. The car is all packed and as you bolt for the car to leave, you are halted abruptly and reminded of a sobering gesture – give your mom a hug and kiss good-bye. The whole car ride up your father endures endless conversation and questions, until he unexpectedly pulls into the parking lot of the local fly shop – you become silent for the first time in hours. It has always been his tradition to stop by first thing. 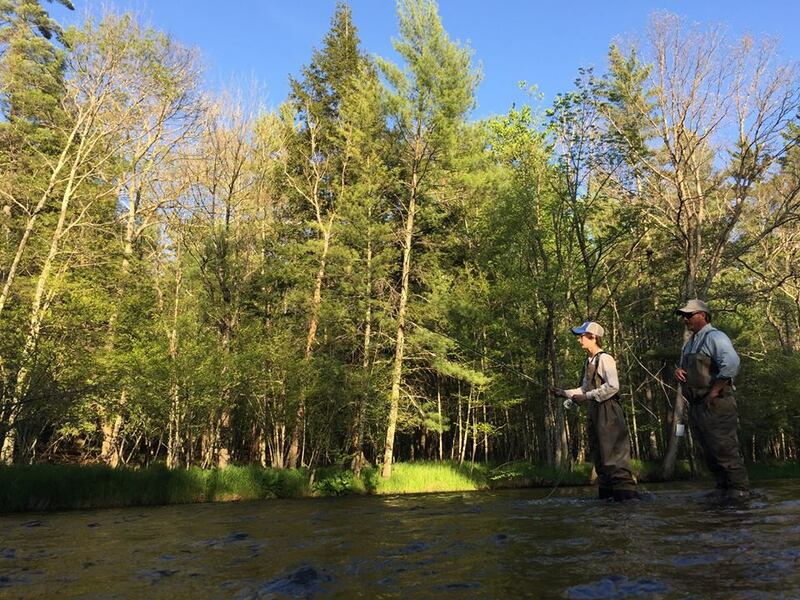 He walks in, you following close behind, and he heads to the board with the up- to- date river report while you gaze upon the endless selection of flies in amazement. A man emerges behind the counter with a cup of coffee who undoubtedly is “the man” who dad said, “knows it all”. He immediately recognizes your dad, and your dad introduces you. Almost instantaneously, you grow fond of this man wearing a trucker cap, button down shirt, sunglasses hanging from his neck, and a disposition you are too young to recognize as a hangover. People like him must be living a dream; either fishing or talking about fishing all day everyday. You relentlessly pepper him with all sorts of questions and ask him if he has any recent pictures. He shows you pictures of a trip he took with clients just a few days before; pictures conveniently taken “in the same area you’ll be fishing this weekend”. You stare at them in awe, images that will be imprinted in your mind for the next month. You still have so much to ask as dad finally tells you it is time to go. You arrive at the cabin, where it sits on the bank of the Pere Marquette River. It is a smaller sized cabin with a deck that wraps around the back where you can watch and listen to the river as it flows. When you enter the cabin you are in a smaller sized living room with a fireplace, a couch, a big chair, a card table with chairs surrounding it, (This is were many late night have been spent by telling stories/lies and solving all of the worlds problems) a sink and fridge are on the right wall. You then walk down a hallway where there are two separate bedrooms with two twin beds in each room and the white throne and shower at the end of the hall. The first thing you do is unpack the car and start making a fire to take the chill out of the cabin, since the heat was turned down. Once you have unpacked the car, your dad pulls himself out a cold beer from the cooler and you grab a root beer out of the cooler. Then night is filled with learning how to rig up your rods, your dad telling old fishing stories, and getting everything ready for the morning. Both of you stay up talking for a little bit longer and then head to bed. It might be easier to sleep on Christmas Eve than this night; all you can think about is the big fish the guy at the fly shop showed you. The time has finally come, which felt like it took forever. Your dad wakes you up with a little shake saying “Are you ready to catch Hog Johnson today?”; Replying with sleepy eyes and a tired voice “Yes.” He has already prepped his coffee, your hot chocolate, and makes sure you are properly dressed for the weather, and double checking that you both have all of your gear. The moment has finally come…. It is dark-thirty. With your headlamp on, your breath is illuminated as you take your first step towards your favorite spot “The Honey Hole”. The river is quietly bubbling and the frost on the ground accents the steam coming off the river with your light. Your dad heads into the river first, to break the current, with you right at his heels. After the vigorous and intense walk across the river (at least what you thought was one at that age) you arrive at the far bank lining the Honey Hole. It is still dark out, so you start gathering up firewood and dad makes a fire while you wait for daylight. Standing around the fire talking your dad’s ear off in excitement the sun eventually brings enough light to the point you no longer need your headlamp. You have your rod ready; dad grabs the net. He slowly guides you out into the river staying immediately upstream of you making the current less intense. With dad standing right next you, you make your first cast of the weekend and the sound of the river rushing against your legs and steam rising off the surface of the water is all consuming. At this age you may have not had any real conceptions of what heaven feels like, but at this moment you are sure this is it. Dad stands their patiently waiting and instructing you on how best to catch these fish. His smile and calmness make you wonder if he is more excited to see you catch a fish than you are. All of a sudden you get a bite, you set the hook, and the fish explodes out of the water. It is a giant steelhead. That moment in time when the biggest fish of your life is cartwheeling through the air; it is almost like time has stop and you are praying to the heavens that the fish will not spit your fly out. Then as the fish crashes back into the water with your fly still stuck in its lip, chaos breaks loose as your fish runs up and down stream, and you question whether you can handle this fish as you hold on for dear life. The reel begins screaming as the fish powers down stream. Dad is holding on to you as though the fish might carry you with it, and he looks down to ask “ Are you ready to go chase him?” Your eyes widen intensely and answer him not with words, but by shaking your head vigorously side to side. Panicking at the thought of chasing this beast downstream, the fish jumps three feet out of the water cartwheeling and starts back up stream like a bullet from a gun. With a new challenge presented, picking up the slack and keeping tight to the fish seems impossible in this moment, but you reel as fast as you can and you keep your rod bent. Arm weakened and slightly short of breath as if you had just battled for your life dad says “I think he is ready.” He heads down stream with the net and with one big scoop the fish is in the net. You just landed the first steelhead of your life (little did you know at that time it would be the biggest you’ll ever catch). You both celebrate with hugs, high fives, and shouts of joy as you stare at one of the most beautiful things you could ever imagine. Pictures are taken and the fish is released. While the fish ever so slowly and gently swims out of your hand, you think to yourself…I will never forget this moment for as long as I live. It may have been a little beginners luck. As years pass, you grow up and your dad grows old, you both still talk about that magical day and all of the other days that you spent on the water together. It felt as though years had been spent on the water with your dad and then all of a sudden, knowing not how or when, you start breaking the current for your dad. However, you are still creating more memories, memories that will not be forgotten and will be cherished for years to come. 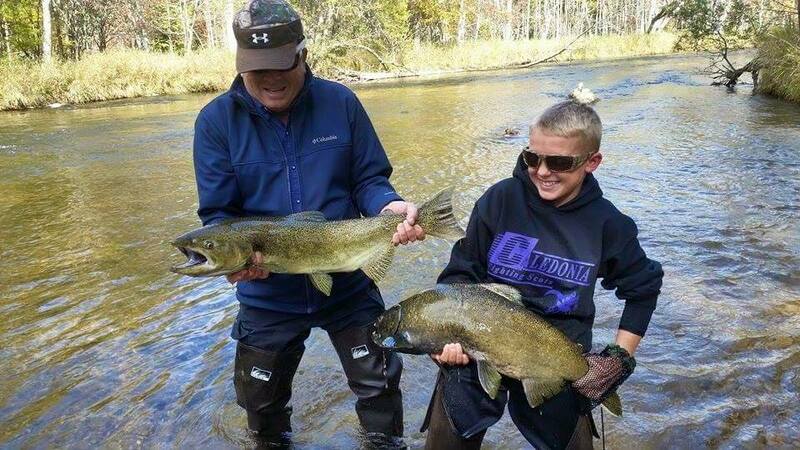 My job as a guide has allowed me to witness these father-son, father-daughter, mother-daughter, and mother-son memories be forged in the minds of our current anglers, and those of the future. My job has also allowed me to be a part of these peoples memories that I too will never soon forget. I consider myself very lucky to be a part of these memories, and for my parents to have let me create so many memories like this when I was a little boy. 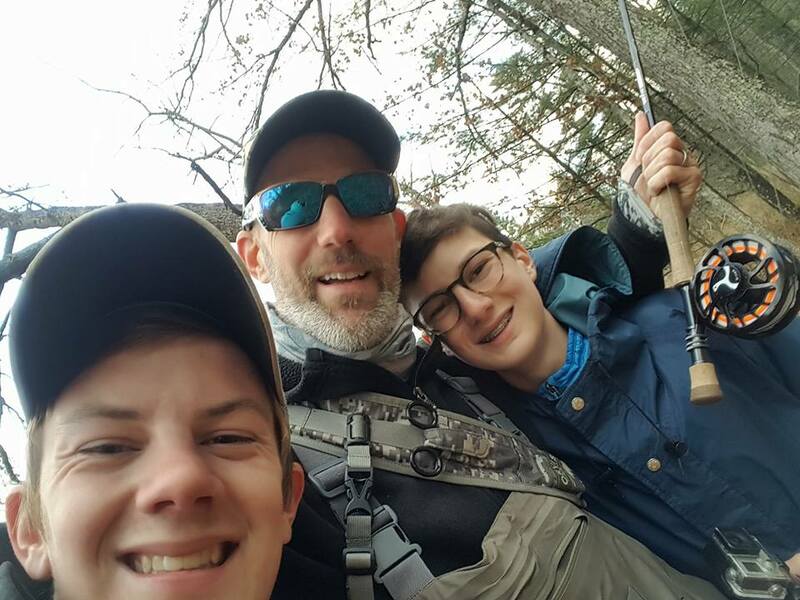 So I humbly ask of you, whether you are a father or mother, get your kids out of the house and into the wilderness to create lifelong memories. 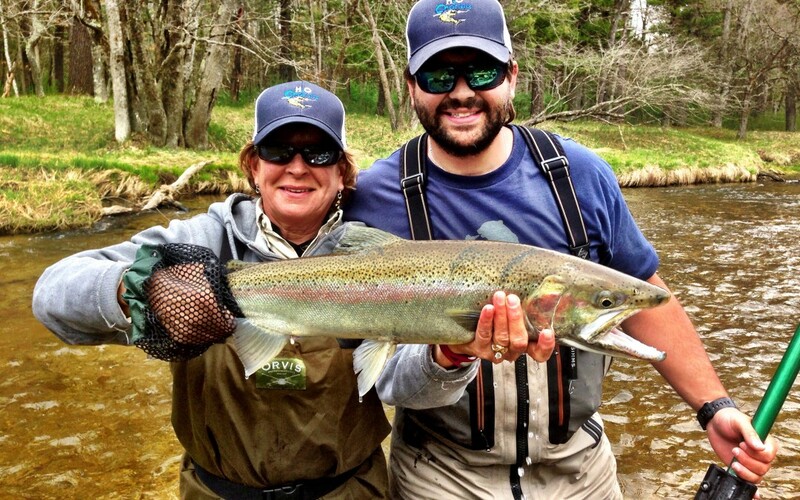 Devon is a Guide at The Pere Marquette River Lodge and is pictured here with his mom.